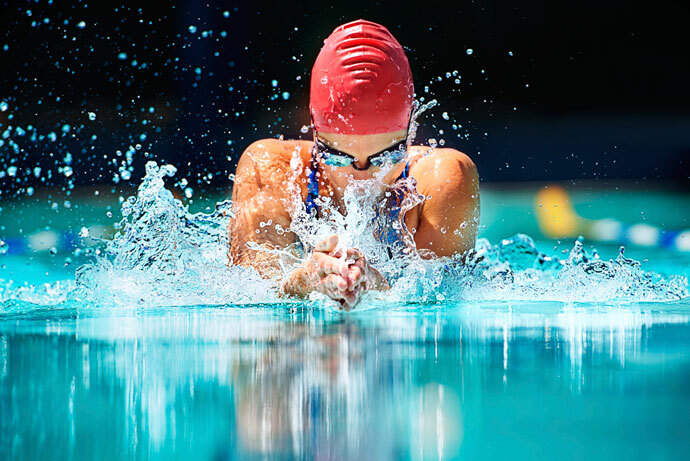 This article provides information about the four swimming strokes used in competitions, which are the front crawl or freestyle stroke, the breaststroke, the backstroke and the butterfly stroke. We also provide information about a few less-known swimming strokes, such as the elementary backstroke, the sidestroke, the trudgen and the combat side stroke. 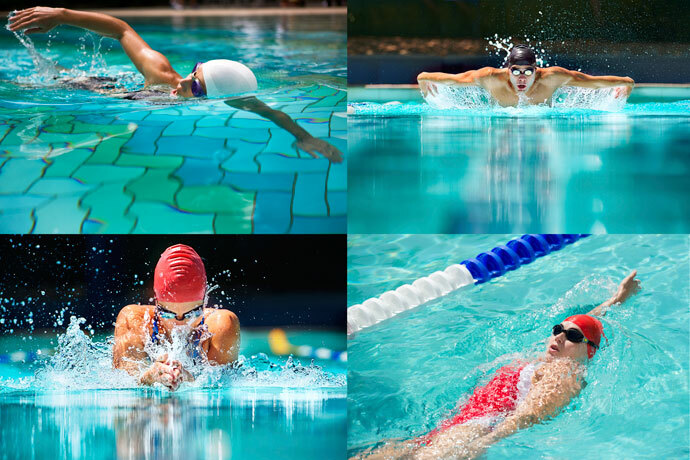 Let’s now have an overview of these different swimming strokes. The front crawl (also often called the freestyle stroke) is the fastest of the competitive swimming strokes. Front Crawl is swum in a prone horizontal position (face down). The arms move continuously and alternately. While one arm pulls underwater from an extended forward position toward the hip, the other arm recovers above water from the hip to the forward extended position. The legs do quick, compact alternate up and down movements, with the feet pointed (flutter kick). To breathe, the swimmer turns his head sideways during the arm recovery, until the mouth is above the water surface. The swimmer inhales quickly, then turns his head down again. There’s always one arm pulling underwater, ideally positioned to deliver powerful propulsion. The arm recovery above water minimizes drag. The continuous flutter kick also provides its fair share of propulsion. Because front crawl is fast and efficient, it dominates swimming competitions where the choice of stroke is free, such as freestyle races or triathlons. For the same reasons, it often is the preferred swimming stroke of fitness swimmers. Slow-motion above and under water video of the front crawl swim stroke. Detailed explanation of front crawl technique. Start learning the front crawl. Breaststroke is the most popular swimming stroke of all. If you go to a public swimming pool, you will most likely see that the majority of patrons are swimming breaststroke. Breaststroke is swum in a prone position. The body goes from a horizontal position during a short, streamlined glide phase to a more inclined position during arm recovery phase. The arms movements are simultaneous and symmetrical. During the backward underwater arm pull, the hands describe an arc, moving from an extended forward position to below the chest. During the arm recovery, the hands move from below the chest to the extended forward position in a straight line. The legs do a symmetrical whip kick. First, the legs are fully extended at the end of the glide phase. The feet then move toward the buttocks during the leg recovery. Finally, during the propulsive phase of the kick, the feet move outward and backward from the buttocks and then inward and backward back to the fully outstretched leg position again. Breathing occurs at the end of the underwater arm pull, when the hands move below the chest and the head and chest move above the water surface. Breaststroke is the slowest one of the competitive swimming strokes. Breaststroke is often the first stroke taught to beginners because you can swim breaststroke while keeping your head above water all the time. This allows beginners to learn to swim without having to use swim goggles or to deal with breathing issues. A breaststroke swimmer filmed in slow-motion above and below the water. Detailed explanation of breaststroke technique. 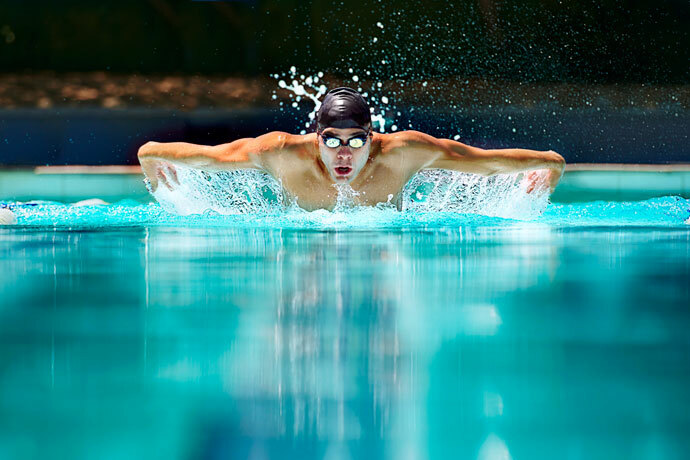 The butterfly stroke is the second fastest swimming stroke, and is also quite exhausting to swim. The butterfly is swum in a prone position. The body executes a wave-like undulation, where the chest and the hips take turns in moving up and down in the water. The undulation is initiated at the head, and the chest, hips, and legs successively follow along. The arm stroke is symmetrical, where the hands trace an hourglass pattern underwater, moving from an extended forward position to below the chest and then toward the hips. The hands leave the water at the hips, and the arms circle forward sideways above the water until they are extended forward again. The legs do a dolphin kick. They are kept together and move up and down in a symmetrical fashion with feet pointed. Breathing occurs during the arm recovery of a breathing stroke cycle, where the head and chest are lifted above the water to permit breathing. Most swimmers alternate breathing stroke cycles with non-breathing stroke cycles, as breathing stroke cycles require more energy to lift the upper body above the water surface. The butterfly stroke is one of the more difficult strokes to learn. You need to master the unusual movements of the body undulation, as well as the dolphin kick and the not-so-obvious arm stroke. Because the butterfly stroke is quite tiring and allows you to only to swim a few lengths in a row, it is mostly used by competitive swimmers. Recreational and fitness swimmers most often prefer to swim front crawl or breaststroke. Nevertheless, the butterfly stroke is a spectacular swim stroke that is quite fun to swim once in a while when you have mastered it. Slow-motion above and underwater video of the butterfly swim stroke. Detailed explanation of butterfly stroke technique. Start learning the butterfly stroke. Backstroke is the only one of the four competitive strokes swum on the back. Backstroke is swum in a horizontal position on the back. The body rolls from side to side toward the arm currently pulling underwater. The head stays in a neutral position, face turned up. The arms alternate pulling in the water and recovering above water. The pulling arm sweeps underwater from an extended forward position to outside the shoulder and then toward the hip. 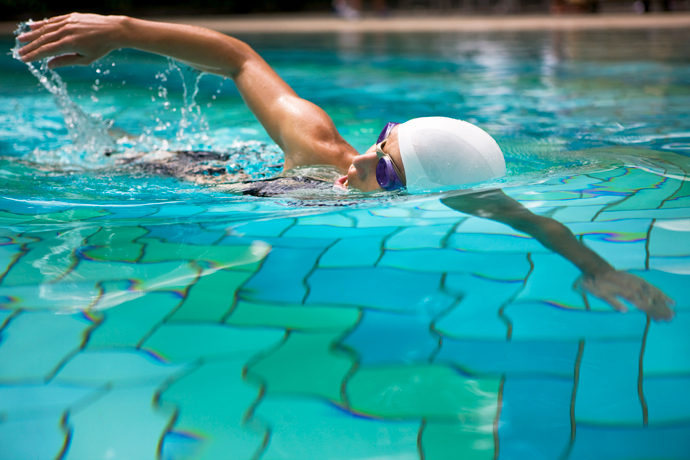 The arm recovery occurs with a straight arm above water. The hand traces half a circle in the air, moving from the hip to pointing upward at the ceiling to being extended forward again. The legs do a flutter kick, where they alternate kicking up and down in quick, compact movements with the feet pointed. Because the face is turned upward, breathing is not restricted. However, most backstroke swimmers synchronize their breathing with their arm movements. In competitions, backstroke is the third-fastest swimming stroke, being faster than breaststroke but slower than butterfly. Recreational and fitness swimmers should consider doing a bit of backstroke during each swim session, as it uses different muscles than front crawl, contributing to a more balanced musculature. Equally, in open water competitions, it can be useful to switch from front crawl to backstroke from time to time to catch your breath and to rest a bit. Doctors frequently advise patients suffering from back problems to swim backstroke, because it allows to relax and strengthen the back muscles. Slow-motion above and under water video of the backstroke. Detailed explanation of backstroke technique. The sidestroke is an older swimming stroke swum on the side. It uses a scissor kick and asymmetrical underwater arm movements. Sidestroke is swum in a horizontal position on the side. The swimmer stays on the same side over the whole stroke cycle. The head is turned sideways and upward, with the face being above water all the time. The arms do different movements but move in accord. In a first phase, the lower arm moves underwater from an extended forward position to the chest, providing propulsion. At the same time, the upper arm, which was resting on the side, bends at the elbow and recovers toward the chest. The hands meet in front of the chest. In a second phase, the lower arm recovers underwater to the extended forward position. At the same time, the upper arm pulls backward in the water, straightening and moving back to the side of the body. The legs do a scissor kick. Initially, both legs are straight. During the recovery, the upper leg bends forward at the hip, while the lower leg bends backward at the hip. Both legs bend at the knee. During the propulsive phase, both legs straighten and move back to their initial position. The upper leg pushes against the water with the back side of the leg, while the lower leg pushes against the water with the front side of the leg. 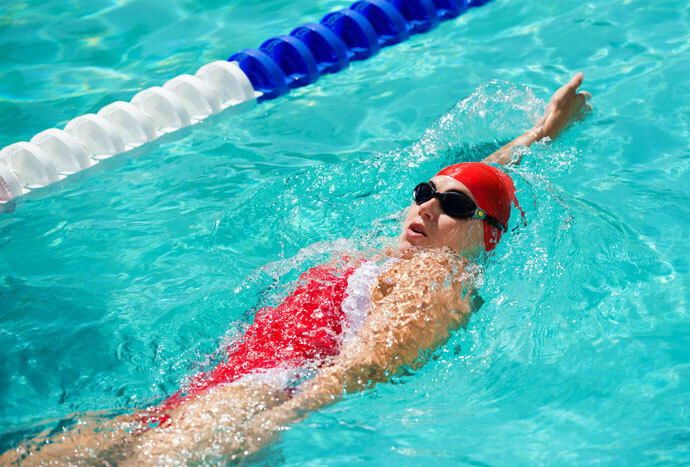 Sidestroke is not used in swimming competitions and is therefore swum less often nowadays. Nevertheless, it is easy to learn and can be a welcome alternative to the more popular strokes. Sidestroke is also one of the swimming strokes used by lifeguards to rescue victims. Detailed explanation of sidestroke technique. Elementary backstroke is a swimming stroke where you swim on the back, using a whip kick and simple symmetrical underwater arm stroke movements. The stroke cycle begins with the arm at the sides and the legs straight and drawn together. The hands move along the sides toward the armpits, then the arms are extended laterally, palms backward. Once the arms are extended laterally, they are brought back to the hips, pushing against the water and providing propulsion. The legs move at the same time as the arms. From the initial position, the thighs are spread apart, the knees bend and the feet are drawn to the buttocks. In a second phase, the thighs are brought together, the legs straighten and the feet are brought together. During this second phase, the inside of the legs and the inner sides of the feet push against the water and provide propulsion. Elementary backstroke is a beginner’s stroke, as it uses a relatively simple technique and allows for unconstrained breathing. However, some balance on the back is required to be able to stay horizontal. Despite its simple technique, elementary backstroke allows you to swim quite efficiently. A disadvantage, however, is that the swimmer cannot see in the direction in which he or she is swimming. Detailed explanation of elementary backstroke. The combat side stroke is a variant of the sidestroke used by the U.S. Navy Seals that is particularly efficient and therefore can be used to swim long distances. The trudgen or trudgeon stroke is an older precursor of front crawl. It basically consists in combining the front crawl arm stroke with a scissor kick. I met a lady at the pool who does a scissors kick with freestyle arms. She says it is a long-distance stroke. I would like to know what the name of that stroke is. I learned to do it, and it seems to be faster than freestyle though I have not timed it. Does anyone know the name of that stroke? Sounds like a trudgeon crawl. Scissor kick like the side stroke with the arm movement of the crawl or freestyle. There is also a double trudgeon which uses a double scissor kick. You are swimming from your hips more than your lower legs. Less knee stress. You have a roll of the hips and legs as you swim that allows you to swim farther longer. Truth is the scissorkick in freestyle is wrong. Im a competitive swimmer myself and that’s not proper. Kicking up and down is the proper way. It sounds like it is the trudgen crawl. I am Hafsah Umar Maigida. I am in primary school 3. Thanks, this page helped me a lot with my homework. I will learn how to swim soon. This is so helpful, it helped me with my homework now I can try swimming soon enough. I’m a lifeguard trained not competitive trained swimmer who’s writing a story in which the characters are learning to swim. At some point, I was doing the Butterfly Arm Stroke with a whip kick, and calling it (Incorrectly) Trudgen. Anybody got the correct name for this butterfly / breaststroke cross? I guess you can call it butterfly arms and frog kick. I like doing breaststroke arms and dolphin kick and that is how we call it. This is a very useful article, a great help for learners trying to master the different types of strokes in the pool. I liked the fact that you have also included training videos about each stroke. I personally like the breaststroke the most, as it requires a wide range of muscle groups to act in coordination. Serves as an effective cardio workout. Good day, Can I download the swimming videos for study purpose only? In the past, I’ve had people literally create copycat sites of my site to try to make a quick buck. So to avoid this, the videos are now specifically tied to the website and can’t be downloaded. Also is a dolphin kick a stroke? I find this funny as though yes, front crawl and butterfly are fast, and when I swim, breaststroke is my fastest. And I was taught front crawl first and then backstroke, breaststroke and finally butterfly.